Redgannet, the blog, has taken a back seat while 10,000 Birds does most of the driving and Mrs Gannet does the navigating, so it has slightly lost its way over the last year or so. 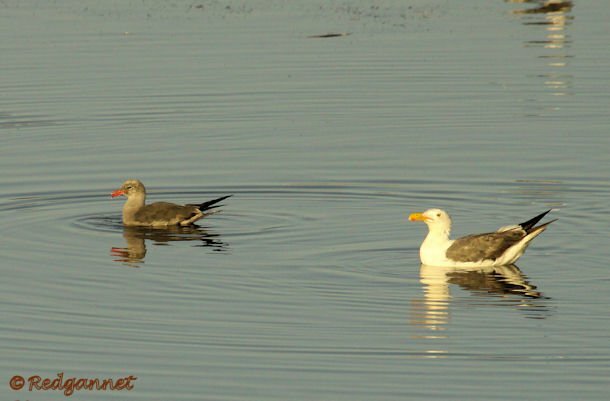 However, my latest trip reminded me that when an out-of-town birder arrives in a strange city (in this case San Francisco) pertinent information should be to hand. If you have the time, a car and a GPS map thingy, then eBird can provide you with hotspots, lists and barcharts. Thus it is easy to organise yourself and visit a few sites to catch your target birds. But, if you have arrived from out of town, with no car and limited time, you need ideas that can easily be achieved from the city centre on public transport. If you don’t mind riding the subway or using trams and buses, then many great sites in great cities will open up to your birding pleasure for less than the price of a cup of coffee. 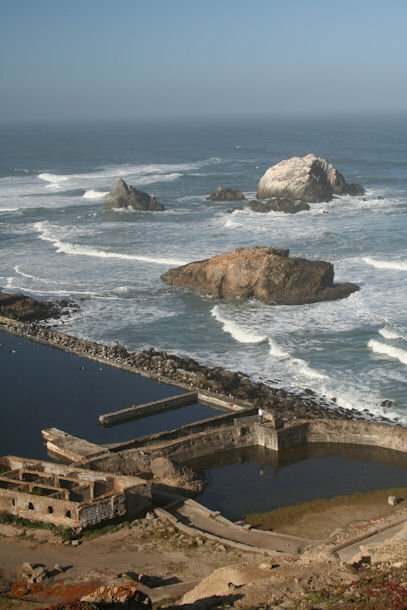 Bus number 38 for example can be seen plying its route across San Francisco City from the northeast end of Market St, onto Geary and all the way to the ocean at Lands End (alternatively known as Point Lobos, Lincoln Park or Cliff House). This is a great place to catch a few west coast specialities if time is pressing. The journey time is about 30 minutes and a hour should be enough for a quick look round. 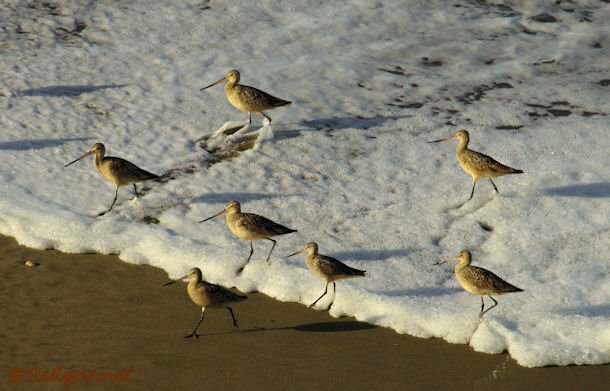 If you have important engagements, business or what not, a west-coast first-timer can be there and back with a handful of lifers before the shops open. A morning visit gives excellent light conditions from behind. Guano-covered rocks (called Seal Rocks I am told, but my guess is that a seal would struggle to get up here to bask) just off the beach will probably quickly catch your attention. 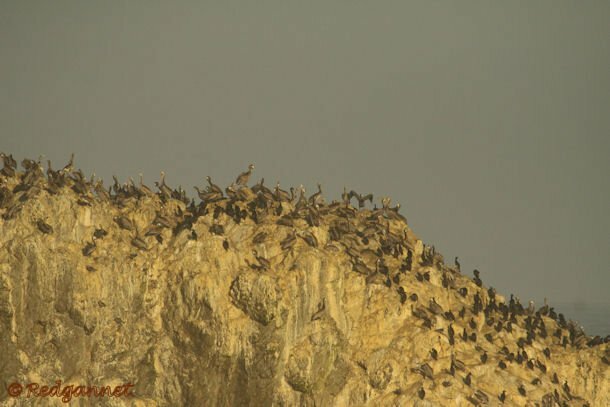 Brown Pelican and Brandt’s Cormorant roost here and can be seen flying in and out all day. 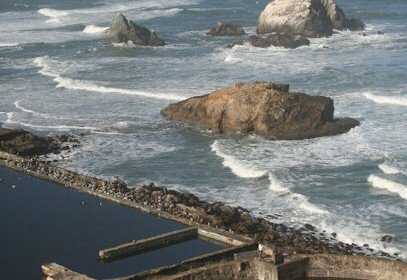 In the foreground are the ruins of a once grand lido, known as Sutro Baths. A few ragged walls and the pool are all that remain of the magnificent facility which became commercially unviable and scheduled for demolition, but burned down just before the insurance ran out. Black Phoebes hawk for flies from the ruins and Western Gulls, California Gulls and Heerman’s Gulls can often be seen in the pool. In winter a few ducks are likely. Low tide reveals a small beach which may attract Marbled Godwit who were playing sanderling games in the gently advancing water during this most recent visit. The gulls may roost on the beach below the seawall of the pool. 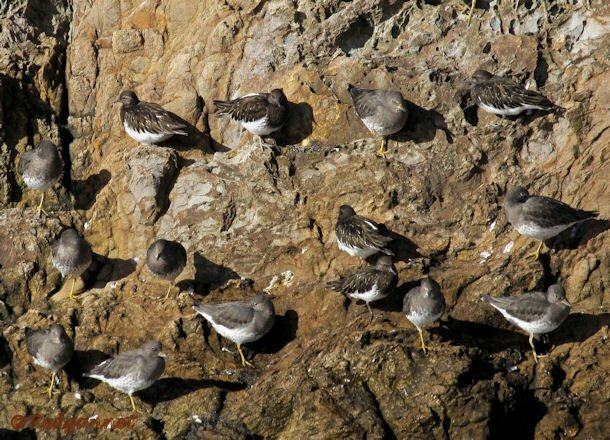 The intertidal areas of the rocks are covered with black barnacles which attract Surfbirds and Black Turnstones, though these will likely be absent during late spring and early summer. 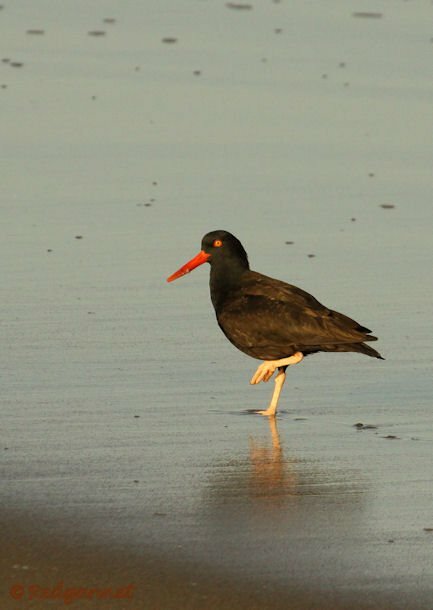 Black Oyster-catchers will usually be found on the rocks too, but this morning each of these species gave their best views in the receding waves. There is a raised, walled area to the right (north towards the entrance of the bay). The rocks are all easily visible from here and you might even indulge in a spot of sea-watching, which could produce loons and sea-ducks during the winter. It is possible to follow a path up the steps which takes the walker up onto the headland where Pygmy Nuthatches can be found and shortly provides a fine view of the Golden Gate Bridge. Pigeon Guillemots will often be seen fairly close in, often around areas of surf scum. Clarke’s and or Western Grebes may be seen from the vantage point, but as with the guillemots, you will probably get a better view on a trip to Alcatraz. Take the bus 38 labelled “Lands End”. One version of the 38 bus turns round at the Veteran’s Hosptal. It is only a couple of blocks short, but if time is against you…..
Bring gloves and a coat to protect you from the wind. The weather in San Francisco can catch you unawares at any time of year. Check the weather reports on the local news. 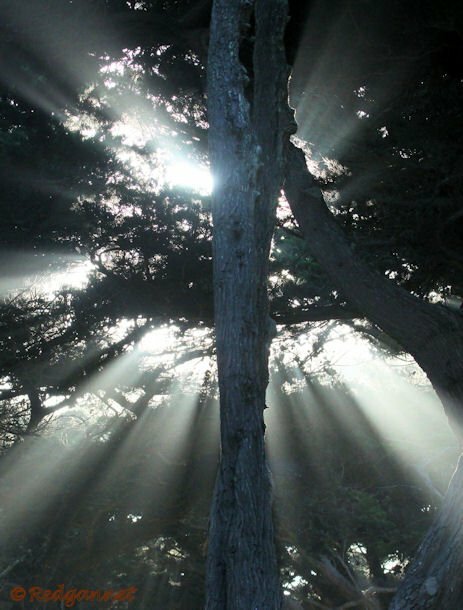 Glorious sunshine in the city is often due to the mist piling up thickly against the headland. 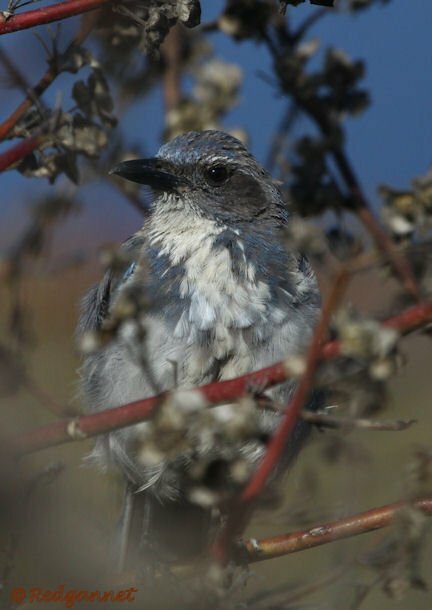 Excellent introduction to birding San Francisco the green way. So many great birds, all for the price of a bus ride! 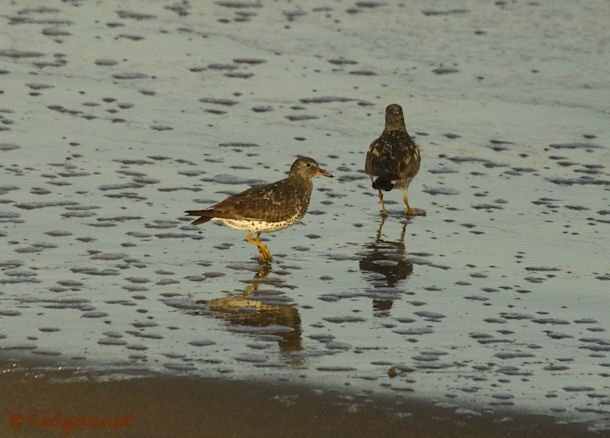 Sadly, all my visits to the city on the bay were pre-birding, so I need to get back there. Where Are You Birding This Final Weekend of August 2015?